As someone with combination skin I am a huge fan of primers, as they help to prolong my makeup and just generally help my skin. They also work to make essentially a smoother canvas for your makeup. I wouldn’t consider applying foundation without a primer; what’s the point in putting in all that work (blending, blending, blending) for it all to disappear before I’m done with it? Without a doubt my favourite is the Smashbox photo finish light, as it makes my foundation stick around more than any other. It doesn’t make a huge difference (it does help a bit) with the appearance of my pores, nor does it particularly help with oil control, but there is something so delicious at looking in the mirror hours and hours after applying it and seeing it just like you left it. 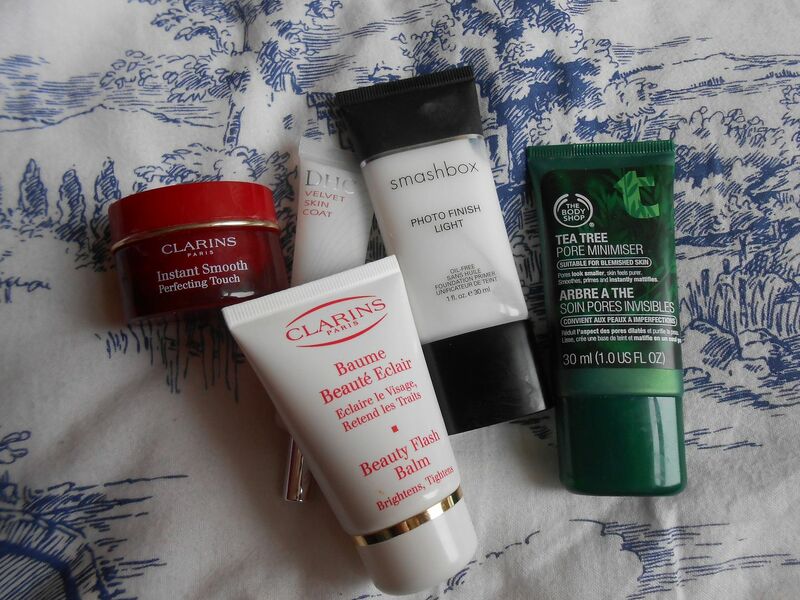 My second favourite is the Clarins Instant smooth perfecting touch, which completely smooths over everything and just helps to make your face look more flawless. I initially thought the pot was really small, but it’s lasting me ages. If you have pores you want to cover, you need this. It kind of magically fills everything in. One for oil control is the Body shop tea tree pore minimiser, which is brilliant if you can get past the oh so strong scent of tea tree. This instantly mattifies your skin, and lasts a really good amount of time. This is particularly good in hotter weather, if it ever comes. I used it in Rome last Summer and it performed nicely. If you want a more velvety complexion, the DHC primer* adds a polished look to your complexion and would probably be good for drier skins. I use this on my cheeks (dry!) and it makes my foundation applier more evenly. Lastly another one for adding some smoothness to your skin is the cult product, the Clarins beauty flash balm. This doesn’t seem to help prolong makeup, but adds some radiance to your face, and who doesn’t want that? It’s a runny liquid that you’re meant to not rub in as it tightens and brightens. Do you prime? What do you use?